Credit : Image courtesy of Klein Sun Gallery and the artist, copyright Ji Zhou. In the first edition of the Harvard Design School’s ‘Project on the City’, titled ‘Great Leap Forward’ because of its focus on China’s Pearl River Delta region, starchitect Rem Koolhaas describes “junkspace” – the ubiquity and standardisation of shopping malls and business towers that coalesce into a disordered and inescapable mass – as a “fuzzy empire of blur.” Koolhaas’ polemical essay laments the loss of modernism’s progressivist ethos, a loss that results an amorphous urban planning and ethics. For Koolhaas, and critics such as Frederic Jameson, junkspace functions as a dystopic vision of the future, one in which blurred boundaries subsume individualism. 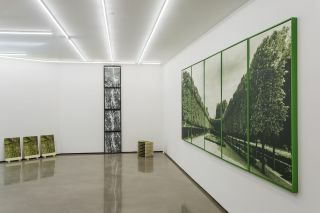 Perhaps acutely aware of this distended perspective, Ji Zhou’s latest exhibition at Klein Sun Gallery, appropriately titled ‘Real Illusion’, offers a dose of pragmatism to such a fatalist cry. 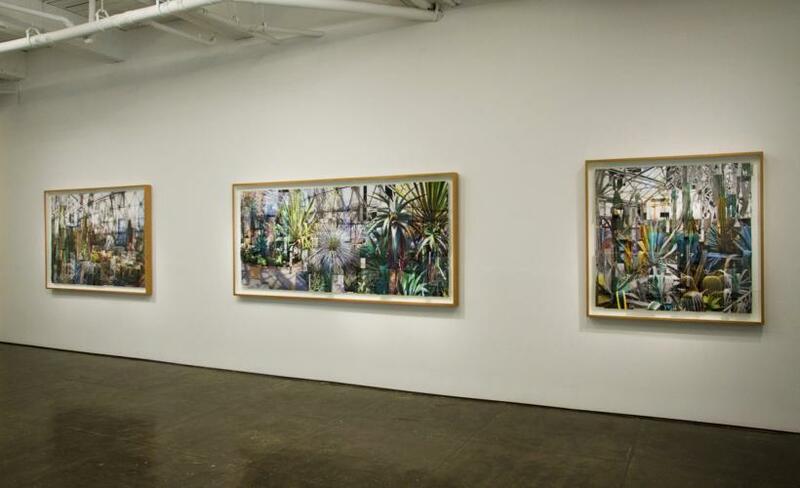 The artist’s practice is characterised by subterfuge and sleights of hand: paper maps are molded into mountaintops and rough terrains, alluding to a Borgesian understanding of fictive topography; stacks of books become skyscrapers, flora threatens to overtake the plane of vision. 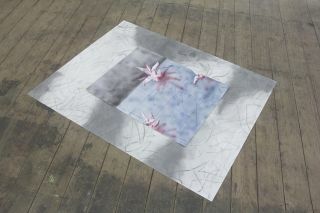 Moving between imagined and inhabited geographies, the artist suggests that our grasp on the tangible world is a tendentious fiction. 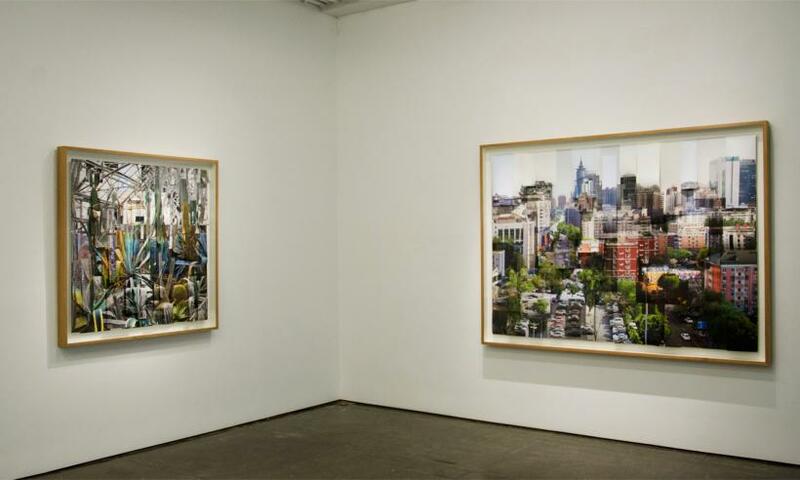 In this latest exhibition, Zhou’s photographs tease the distinction between civilised and untamed; seen together, the series of works are a play on the phrase “urban jungle”. ‘Building 1’ (all works 2017) can be read alternately as an example of Koolhaas’ junkspace theory, wherein the composition of glass and steel edifices crowded together in a skyline can represent any globalised metropolis. 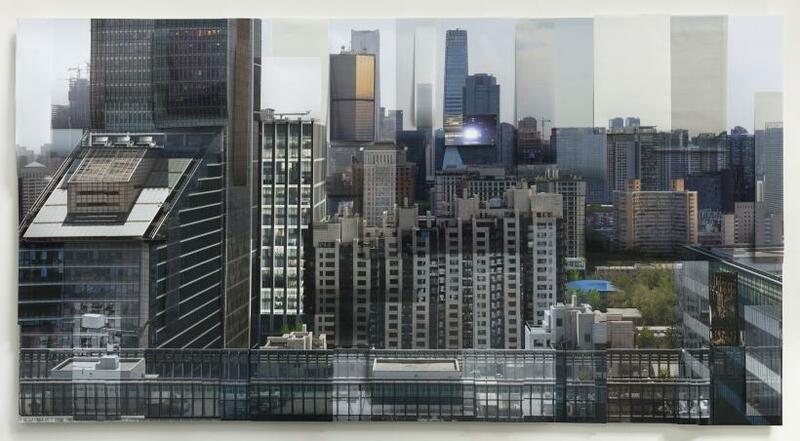 Yet, the composite nature of the work – it is a series of photographs of the same skyline loosely collaged within the frame – allows Zhou to examine the materiality of the photographic medium. 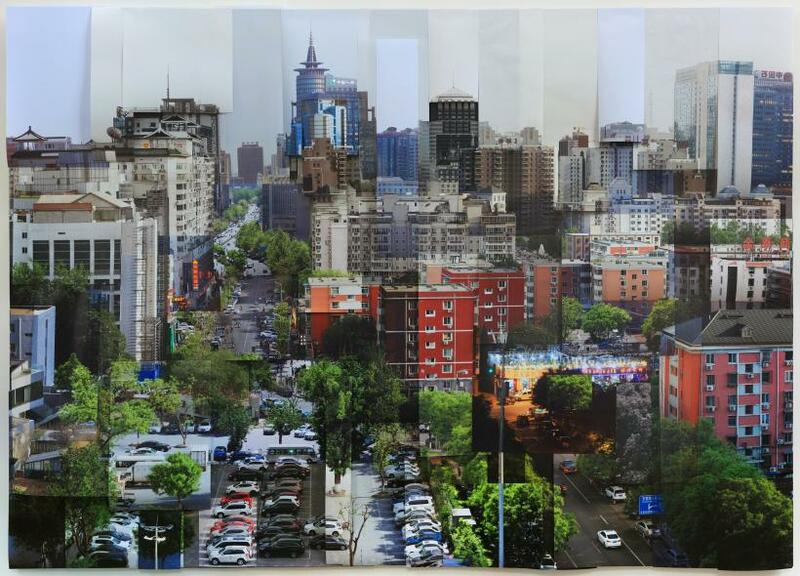 Behind the glass, Zhou’s photographs bend and swell, animating the photographs with the liveliness of the cities they capture. ‘Building 3’ is similar in composition, consisting of images of buildings captured under different conditions of light, much in the same way that Monet captured Rouen Cathedral or his quiet haystacks. Zhou’s careful consideration of this meditative temporality is referential to the mechanisms of the camera – the collision of time and light to produce an image. 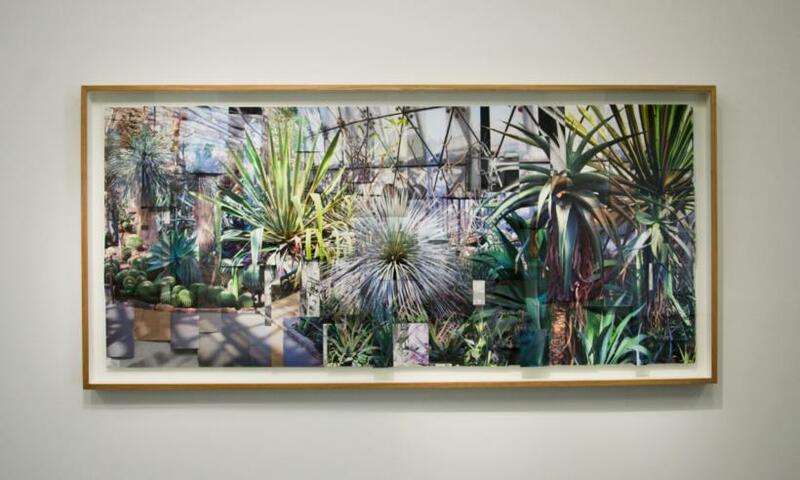 Far from being overly didactic to this phenomenon, the photographs are instead nearly humble in their revelatory nature, which is particularly evident in Zhou’s greenhouse images. 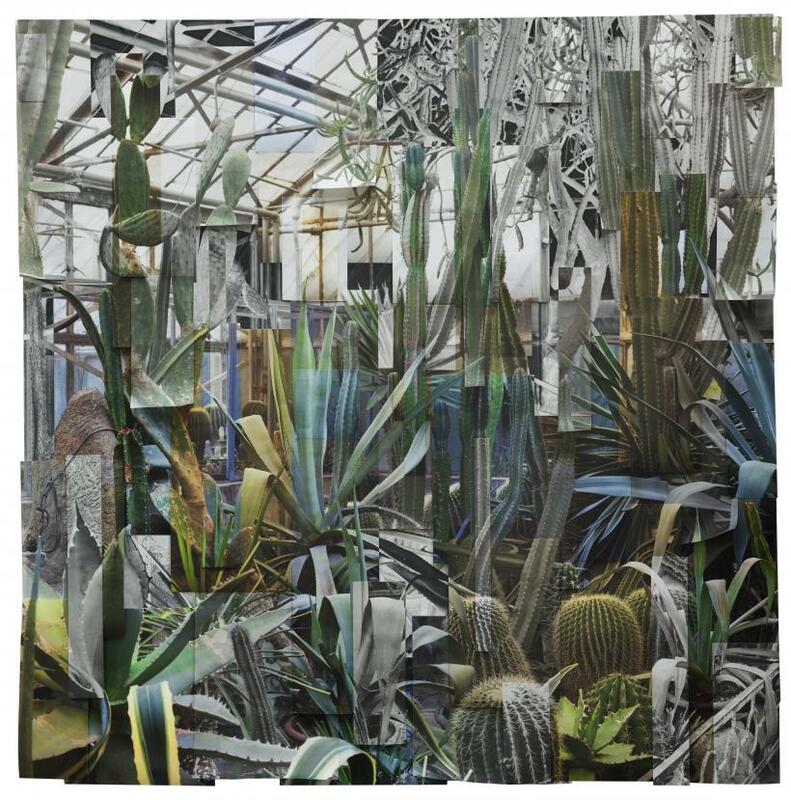 Like their urban skyline counterparts, these composite shots of cactuses and ferns alternate in pigmentation and lighting but coalescence into a recognisably lush composition. At first, their gradations and fractured nature give the work a schematic feel, yet a longer look reveals their latent vitality. Like the disjunctured cityscapes, these greenhouses pulse with life. Yet, as the artist is quick to remind us through the materiality of his photographs, these vital signs are misleading – illusive and ephemeral.